Chilli Pork is a delicious Indo Chinese dish that is very popular as an appetizer and also as a side dish with Fried rice or Noodles. In Kerala, stir fried Beef with vegetables, Chilli Fish, Chilli Chicken or Chilli Pork dishes are the most preferred dishes in restaurants along with Kerala Parotta. It is extremely delicious with plenty of flavors and can be served with Noodles, Fried rice or Chilli Garlic Fried rice. The juicy, succulent pork pieces coated with chili flakes are a real treat to all Pork lovers! Since many of my friends were asking for this recipe, I decided to visit the meat shop to get some tender lean pork meat. 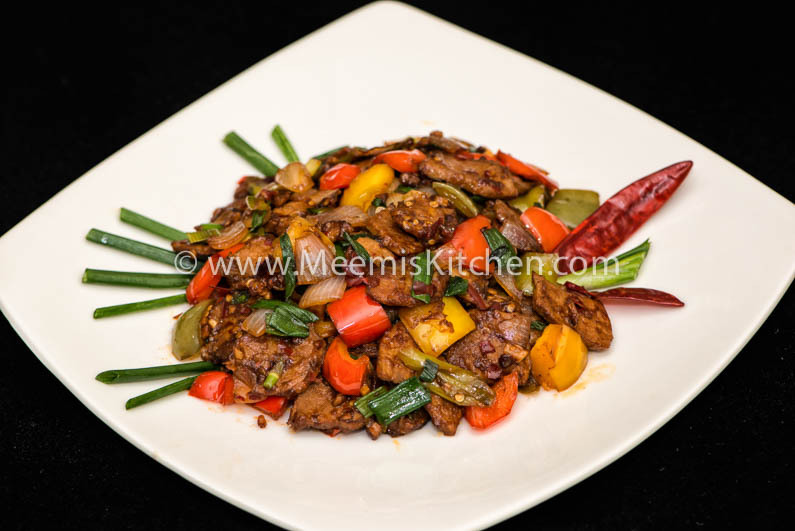 For Chinese Chilli Pork, you need lean and tender meat as we stir fry them to keep the juices intact, rather than cooking like other pork recipes- Pork Curry, Pork Pepper fry, Pork and koorka. Cooking makes them little harder, but when you marinate properly and roast/ sear them it tastes extremely delicious! I also added red and yellow Bell pepper/ Capsicum to add to the effect and the dish came out brilliant, pleasing for the eyes and a plush treat to the palate. It is easy to cook, juicy and flavorful and a perfect dish for special occasions or get-togethers. The searing of the meat and the chili flakes is what makes this dish special. It is another original recipe of mine and hope you will like it. This is the dry version and you may try the semi gravy version with added water and corn flour and little extra sauces to balance out. You might also like my Honey Chicken, Beef with Mushroom, Grilled Tandoori chicken, Chicken Roast, Duck Roast, Beef Pepper Fry, Chicken Kebab, Pepper chicken with lime, Fried Squid rings, Kakka Irachi Ularthiyathu and Beef Ularthiyathu. Also check my Nadan Pork Roast and special Pork Pepper Fry, Pork and Koorka recpes, if you enjoy Pork. 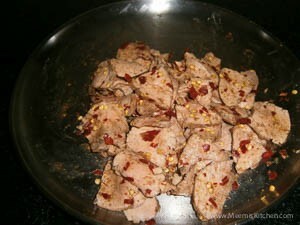 Serve Chili Pork as a starter or serve hot with Chilli Garlic Fried rice, Noodles, Whole wheat Naan or simple Fried rice. 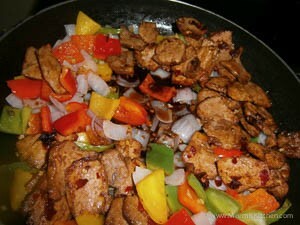 Hope you will try my Chili Pork recipe and let me know your feedback. Enjoy!! Wash, clean the fat if any and pat dry the Pork chunks. Gently pound the meat with a mallet on both sides. 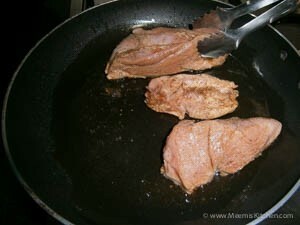 Prepare marinade with soya sauce, pepper, vinegar, sugar and salt and coat the Pork chunks. Keep the remaining marinade. Marinate for 1 hour or more. If you like it well done, you may cook this in a pressure cooker till one whistle, with just half a cup of water. Skip this step, if you like it rare. Heat a pan and add 1 tbsp oil. 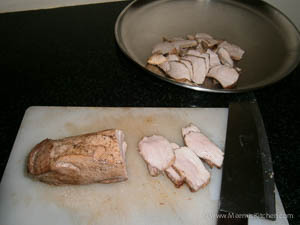 Place the chunks and sear all sides till slightly brown as shown in the picture. Remove it from the pan to a cutting board and let it sit for 5 minutes or more and slice them into thin squares or bite size pieces. 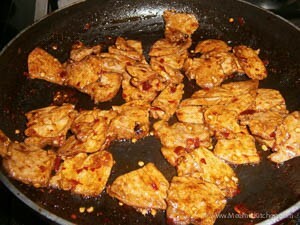 Mix the sliced pork with the remaining marinade and 1 tsp of chili flakes. Heat the pan and add the Pork pieces back. Sprinkle little corn flour and stir fry for 5-10 minutes. Keep aside. Take another pan, heat 1 tbsp oil and add sliced green chilies, finely chopped ginger and garlic and sauté well. Add cubed onions and fry for another minute. 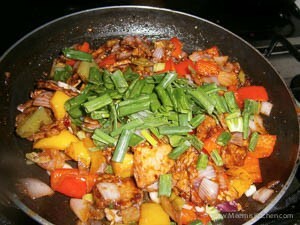 Add cubed capsicum, then add pork pieces back, along with spring onion bulb chopped. Add 1 tsp chili flakes and fry. Mix the sauces and sugar and add to the pan. Combine well. Mix the corn flour with ¼ cup water and add to the pan. Adjust the salt. Let it dry and coat the pieces. Lastly add chopped Spring onion greens and remove from fire. Transfer to a serving plate and enjoy with Fried rice, Noodles or Parotta or serve as starter. Add more green chilies or chili flakes if you like it spicy. You may cook the Pork in a cooker if you like it more tender and well done. Adding sugar is to tenderize meat and to balance the flavors. 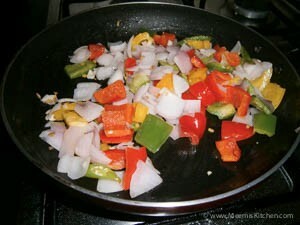 The Onions and capsicum should not be overcooked so just stir fry for a minute to make it crispy. I have used Red and Yellow Bell Peppers/ Capsicum for more visual appeal. White Onion, is the best choice for Chinese dishes as it stays crispy. If you like with gravy, add more water and adjust the measure of sauces and add corn flour to make a thick gravy. Please try this Chilli Pork recipe and let me know if you like it or share with your friends through the share buttons on the side. It will definitely inspire me. Thanks and God Bless! !